For the continent’s renewables sector to take off, it will have to draw on past experiences, mobilise investors and ready technical and financial markets. Speaking in May, African Development Bank president Akinwumi Adesina had high praise for South Africa’s Renewable Energy Independent Power Producer Procurement (REIPPP) programme. It is ‘the best in Africa and provides us with the platform we can use to support similar things in other countries’, he said. Adesina is far from the first to suggest that this successful programme has lessons for other African countries, especially in terms of energy governance. However, these have to be teased out because South Africa is far from being a typical African country. Of course, in South Africa the future viability of the REIPPP has been questioned following the decision by the national energy company Eskom to halt the signing of power purchase agreements in 2015. Nevertheless, implementation prior to that blemish was dramatically successful. Since 2011, it has attracted substantial new investment (ZAR194 billion) in what was previously viewed by the financial sector as a high-risk area. The programme has procured 6 376 MW of generating capacity from 102 independent renewable energy producers, of which 2 738 MW had been connected to the grid by September 2016. It has also generated more than 32 000 jobs, according to the Independent Power Producer (IPP) office. Reports on the REIPPP frequently refer to the scale of international funding – 27% of the total – as evidence of the programme’s attractiveness. However, it is the fact that ZAR141.1 billion (73%) of the total financial requirement so far was raised inside South Africa, which really stands out. Financiers include risk-averse sources such as pension funds and represent a resource not domestically available to any other African country. According to economist Mike Schüssler, South Africa has the sixth-highest pension assets-to-GDP ratio in the world. Neeraj Sanjay Mense, analyst at energy consultancy Frost & Sullivan, says the scale of South Africa’s programme means it cannot immediately be replicated elsewhere on the continent. 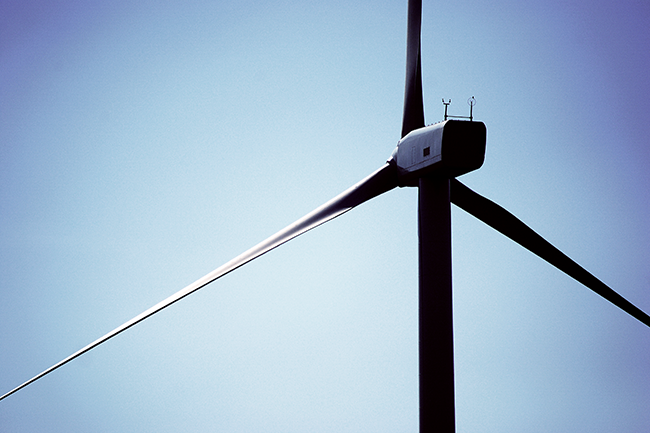 ‘South Africa’s renewables procurement plan is over 15 000 MW,’ he says. That is considerably more than the total generating capacity of every country in sub-Saharan Africa. ‘This scale means that it has been possible to structure a “rolling” bidding process consisting of several windows.’ Companies can participate on an ongoing basis, establishing offices and enduring partnerships, as well as manufacturing facilities, in the country. A long series of bid windows – there have been five so far – also provides opportunity to alter and fine-tune the process. Requirements for domestic, black empowerment ownership have increased with each window, as have local manufacturing content requirements. South African and international financial, engineering and consulting companies have geared up their own capacities as the programme has proceeded. Mense’s colleague and fellow Frost & Sullivan analyst, Nikhil Deshbhratar, argues that there is no reason why this increased ability should not be applied elsewhere in Africa. Many believe the primary reason for the REIPPP’s success is to be found in the energy governance space. 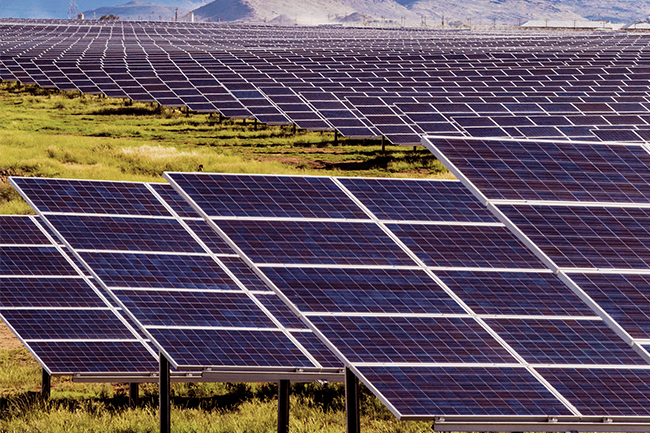 Brenda Martin, chairperson of the South African Renewable Energy Council, argues that ‘foreign investors have responded positively partly because the rules are clear and have been applied fairly and consistently’. University of Cape Town Business School energy specialist Anton Eberhard considers institutional arrangements to be at the centre of the programme’s success. Foremost among these, he says, is the ‘ad hoc institutional status of the IPP office’. Reporting to the Department of Energy (DoE), the IPP office represents the liberation of renewable energy policy from the clutches of Eskom. National energy companies such as the parastatal can be problematic when it comes to radical new initiatives, including the development of renewable energy programmes. At best, they tend to be inherently conservative and focused on their existing mandate, resisting what they perceive to be radical changes. At worst, they act as gatekeepers and sources of political patronage. In Africa, many are cash-strapped. Eberhard suggests that it was this independence that allowed the IPP office to ‘emphasise problem-solving rather than enforcement of administrative arrangements’. It also had expertise and credibility, he adds, and ensured that bid processes were notably transparent. However, Eberhard points out that these virtues are not achieved overnight. South Africa has a long ‘pre-history’ before creating a successful renewables programme. The ‘clear, fair and consistent’ rules Martin refers to were built on earlier, unsuccessful attempts to draw energy investors into generation projects. They revolve around a clear policy choice, rooted in experience, to prefer the mechanism of competitive energy auctions over the main alternative, feed-in tariffs (FiTs). FiTs are a mechanism whereby regulators set the per-unit fee that will be paid to private energy producers once a project is up and running, and then request bids from private consortia interested in implementing it. Competitive tenders, on the other hand, allow the private-sector bidders to suggest the tariffs they need to earn to justify the project. This approach has the advantage of being extremely responsive to changes in the price of the technology and thus works extremely well with renewable energy where the prices of PV cells have dropped 80% over the past few years. 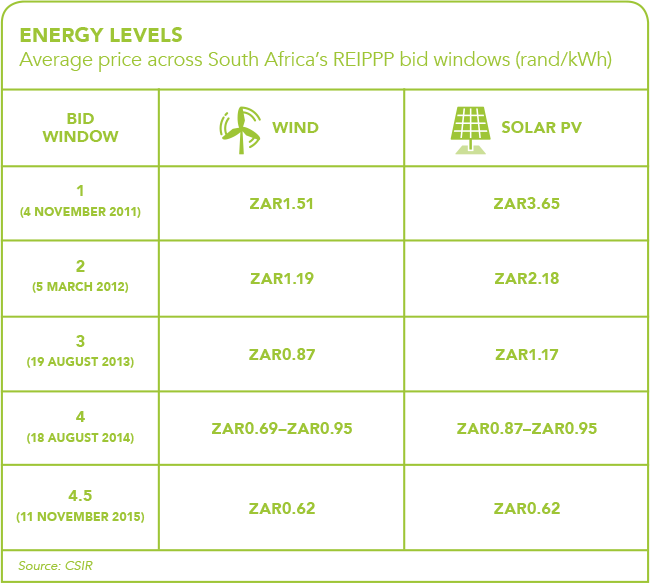 This has been reflected in the declining cost per kilowatt/hour (kWh) of the offers made in successive South Africa bid rounds, from ZAR3.65 (solar PV) and ZAR1.51 (wind) in Round 1 (2011), to ZAR0.62 for both technologies in Round 4.5 (2015). Mense says the 2015 price was 40% cheaper than the cost of baseload coal generation. Eberhard argues that the REIPPP has its origins in the earlier Renewable Energy FiT (REFiT) programme, launched by NERSA in 2007. That initiative was significant in that by using FiTs, it acknowledged a role for IPPs for the first time in South Africa. Previously, all generation capacity had been financed and constructed by Eskom. The programme for which REFiT was intended (two peaking plants) was, however, a failure – attracting just two bidders that later dropped out. Eberhard argues that changes initiated by NERSA, involving lower tariffs and a failure to index future returns against inflation, had spooked them. Other African countries have explored the use of FiTs before settling on competitive auctions. Mense says Kenya, Tanzania and Uganda all use a mix of the two strategies. Auctions have become more popular over the past few years – partly because of the South African experience – yet FiTs remain an easier strategy for small projects that are often more appropriate in emerging African economies. Kenya is replacing FiTs with competitive auctions this year. Mense also comments that the chosen technology should match the resources of a particular country or region. ‘Wind works in South Africa and a few other areas but not in most of East Africa, with the exception of the Kenyan highlands. But in Kenya you have geothermal that may require different arrangements,’ he says. In South Africa, a plurality of institutions, a highly capable programme manager and a long process of evolution were necessary to create the conditions needed for a successful renewables programme. It is notable that a key consequence of the REFiT experience (from 2007 to 2010) was to wrest control of renewable energy policy away from Eskom and return it to where it properly belonged, the DoE. NERSA is an independent body, reporting to the department, and established to set prices in the electricity sector. There is no doubt that in embarking on REFiT, it was exceeding its mandate. In reining it in, however, the DoE was able to make space for the creation of the IPP office, which would implement the REIPPP. Deshbhratar explains that capable institutions do not emerge out of thin air. ‘The IPP office needed the input and previous experience of National Treasury’s public-private partnerships unit as well as the backing of the DoE, and input from academia, the international development community and the private sector. This didn’t happen overnight. It had to be deliberately created, and it was critical decision-makers who were willing to draw on the international “best-in-class” experience available,’ he says. All too often, countries are unwilling or unable – usually due to vested interests – to do this sort of thing.